[143 Pages Report] The non-thermal processing market, was valued at USD 760.7 Million in 2016. It is projected to reach USD 1,224.2 Million by 2022, at a CAGR of 8.4% from 2017. Non-thermal processing technology is used to extend the shelf life of the food products and to enhance their appearance. Non-thermal processing technologies perform the function of food safety and preservation by inactivating the microbial cells. The growth of the packaged food industry and R&D activities are driving the market for non-thermal processing technologies. Market players are responding to new opportunities by expanding their global presence and product offerings. This report includes estimations of the market size in terms of value (USD million). 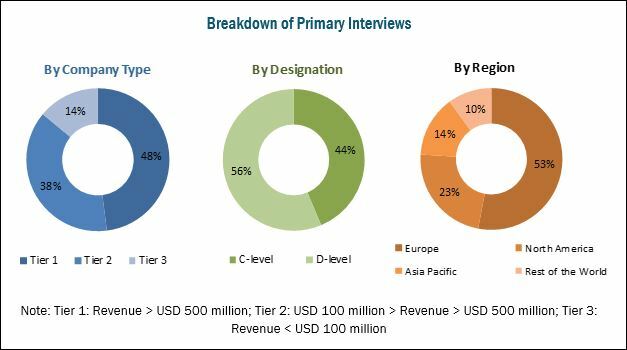 Both, top-down and bottom-up approaches have been used to estimate and validate the size of the non-thermal processing market and to estimate the size of various other dependent submarkets in the overall market. Key players in the market have been identified through secondary research through various sources such as the US Department of Agriculture (USDA), the European Federation of National Associations of Measurement, Testing and Analytical Laboratories (EUROLAB), the World Health Organization (WHO), I.E. Canada (Canadian Association of Importers and Exporters), the Environmental Protection Agency (EPA), the Food and Agricultural Organization (FAO), the Food Safety Council (FSC), and Statistics Canada, and their market ranking in the respective regions have been determined through primary and secondary research. All percentage shares, splits, and breakdowns have been determined using secondary sources and were verified through primary sources. The non-thermal processing ecosystem comprises non-thermal processing technology providers such as Bosch (Germany), Emerson (US), Bühler (Switzerland), Hiperbaric España (Spain), Avure Technologies (US), CHIC FresherTech (US), Elea Technology (Germany), Pulsemaster (Netherlands), Nordion (Canada), Gray*Star (US), Dukane (US), and Symbios Technologies (US). This research report categorizes the non-thermal processing market based on food product, technology, function, and region. Segmental analysis, which provides a further breakdown of the in the HPP, PEF, irradiation, ultrasonic, cold plasma, and other technologies segment. Further breakdown of non-thermal processing in food products such as meat, fruits & vegetables, juice & beverages, seafood, and other food products. Further breakdown of the Rest of Asia Pacific non-thermal processing market, by countries. The global market for non-thermal processing market has grown exponentially in the last few years. The market is estimated to be valued at USD 818.6 Million in 2017, and is projected to reach USD 1,224.2 Million by 2022, at a CAGR of around 8.4% from 2017. Emerging economies such as India, China, and Brazil are the potential primary markets of the industry. Growing trend of novel technologies and process optimizaiton are driving the market for non-thermal processing. Latest trends in the food industry for processing, preservation, retention of sensory attributes without the application of heating techniques are fueling the research activities for the development of advanced non-thermal food processing technologies. The conventionally used thermal food processing technologies may lead to changes in product characteristics such as flavor, color, texture, or nutritional value due to the application of heat. Whereas, non-thermal food processing technologies help retain these characteristics in the food products with minimal or no changes to the product profile. This factor makes it advantageous to use non-thermal processing technologies over thermal technologies for processing food. Energy consumption is very low in the non-thermal processing of food as compared to thermal processing. The food quality and safety can be assured using non-thermal technologies. Hence, these technologies are receiving wide acceptability from the government and federal bodies. To meet the market demand for safe, functional, and quality food products, the various companies and research institutes are extensively involved in the innovational programs to develop advanced and cost-effective non-thermal processing technologies. 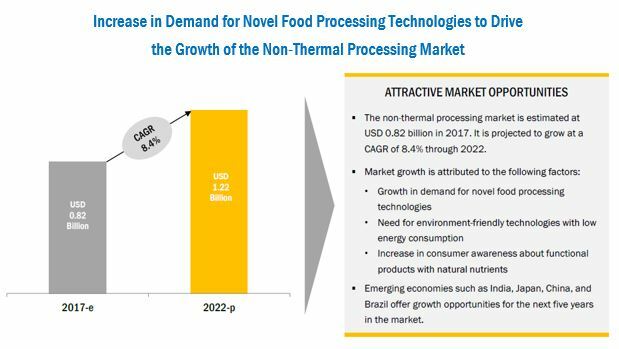 The non-thermal processing market for food, based on food product, is segmented into meat & seafood, fruits & vegetables, beverages, and others. The meat & seafood segment is estimated to dominate the market with the largest share in 2017 since meat & seafood products are more prone to bacterial contamination. This is followed by the beverages segment as non-thermal technologies are widely used for the manufacturing of beverages for pasteurization, fortification, and other activities. The non-thermal processing market for food, based on technology, is segmented into HPP, PEF, ultrasonic, cold plasma, irradiation, and others. The HPP segment is projected to grow at the highest CAGR among all non-thermal processing technologies from 2017 to 2022. The technique preserves the freshness of food products as well as aids in extending their shelf life. It also accommodates the current consumer demand for natural, fresh, and minimally processed foods, as no preservatives or additives are added to the products. Due to these factors, the market is projected to grow at a significant rate in the future. Based on function, the ultrasonic market non-thermal processing is segmented into microbial inactivation, quality assurance, cutting, emulsification & homogenization, cleaning, and others. Among all, microbial inactivation is anticipated to be the largest segment. It is one of the widely used functions of non-thermal processing technologies for food preservation. Irradiation is an effective non-thermal technology used for microbial inactivation. Food products undergo high frequency radiation treatment, leading to the disintegration of the cells of microorganisms. 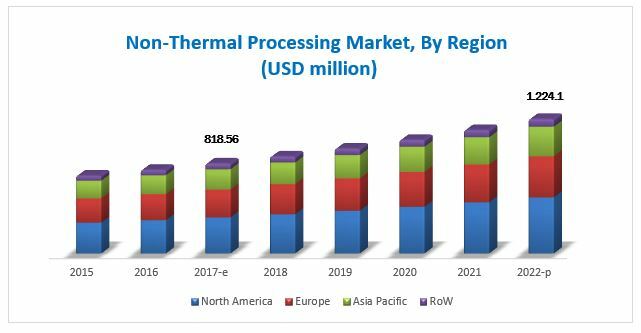 The North American region is estimated to dominate the non-thermal processing market in 2017, and is further projected to grow at the highest CAGR during the review period. Non-thermal processing is developing more rapidly in North America due to the demand for extended, safe, refrigerated shelf life, novel food processing requirements, and favorable food preservation legislations. Food safety authorities have approved several non-thermal technologies for food processing due to their efficiency and minimum effect on the product’s nutritional and textural characteristics. However, high capital investment in non-thermal technologies might hamper the growth of the global non-thermal technologies market during the review period. Expansions, new product & technology launches, acquisitions, agreements, collaborations, and partnerships are the key strategies adopted by the players to ensure their growth in the market. The market is dominated by players such as Bosch (Germany), Emerson (US), Bühler (Switzerland), Hiperbaric España (Spain), and Nordion (Canada). Other major players in the market include Avure Technologies (US), CHIC FresherTech (US), Elea Technology (Germany), Pulsemaster (Netherlands), Gray*Star (US), Dukane (US), and Symbios Technologies (US).